MANILA, Philippines – The November 2017 Customs Broker board exam results including the full list of passers, top 10 examinees, top performing schools, performance summary of schools, among other related announcements are available at this website as PRC releases the results online on November 28, 2017 or three (3) working days after the last day of board examination. As announced, 1,114 out of 2,093 successfully passed the exams. The November 2017 Customs Broker licensure exams are administered by PRC Board for Customs Brokers headed by its Chairman, Nenette T. Dagondon and its member Rolando L. De Jesus on November 15-16, 2017 at PRC testing centers in Manila, Cagayan de Oro, Cebu and Davao. According to the Commission’s Resolution No. 2016-1019 series of 2016 entitled “Schedule of Licensure Examination for Year 2017”, the target release date of November 2017 Customs Broker board exam result will be in three (3) working days after the last day of board examinations or by November 28, 2017 (Tuesday). However, results may also be released earlier or later without prior notice. On the same exam conducted by PRC on November 2016, results were released after two (2) working days while on November 2015, results were out after three (3) working days. The schedule of online appointment for issuance of Professional ID and Certificate of Registration will be on December 5-6, 2017. Customs Broker is one of the programs with average number of examinees being administered by the Professional Regulation Commission. On the most recent Customs Broker exams conducted by PRC on November 2016, 1,030 out of 2,022 examinees passed. Mark John Aguilar Balayan from International School of Asia and the Pacific topped the exams garnering 93.75% rating followed by Karaine Ruth Lobenia Canciller from Adamson University having 92.50%. Gordon College formerly Olongapo City College was the top performing school garnering 88.71% passing rate or 55 out of 62 examinees passed. On November 2015, 721 out of 1,764 examinees passed the exams. Gordon College was the only school in the top performing schools list having 24 out of 30 examinees passed or an equivalent 80.00% overall passing rate. Meanwhile, four examinees landed in the top spot garnering 90.75% rating. They are Jarohsan Masangkay Dang-Ay from International School of Asia and the Pacific, Gladys Joy Casasola Obsum from Adamson University, Sharmaine Nuas Punio from Batangas State University - Batangas City Campus and Marco Peralta Tactacan from Gordon College. 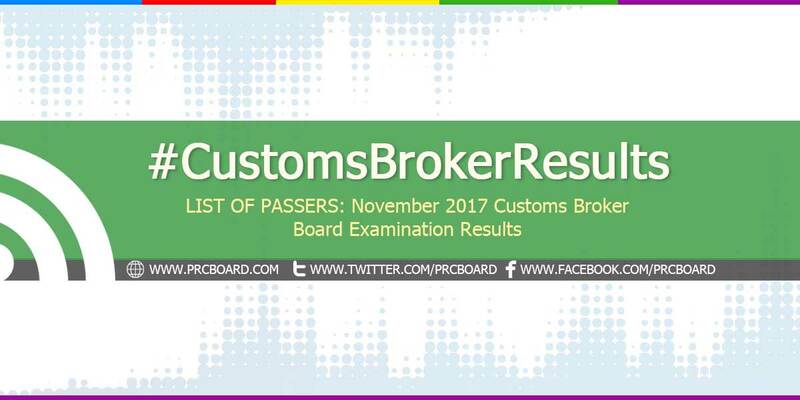 To receive up-to-date news on full results of November 2017 Customs Broker board exams, we advise our visitors to bookmark this page, visit PRC official website or follow us at our social media pages via Facebook and Twitter. Hi wala paba result sa customs broker?